28 August 2015. Engineers at University of Toronto in Canada designed a biocompatible mesh framework that makes it easier to grow synthetic heart muscle tissue for research and medical use. 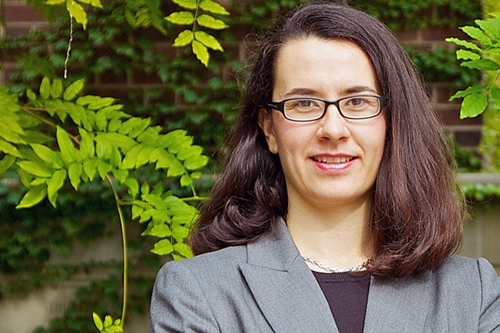 The team led by chemical engineering professor Milica Radisic published its findings today in the journal Science Advances. Radisic and first author Boyang Zhang are co-founders of Tara Biosystems, a company in New York developing heart-on-a-chip tissue models for toxicology testing and drug discovery. Tara Biosystems, started last October with backing from the venture capital company Harris & Harris Group, is co-founded by researchers from Columbia University and MIT. Radisic and colleagues are seeking a simple, quick, but robust method for creating synthetic heart tissue that first requires a framework on which heart muscle cells can form and reproduce in order to grow. While heart muscle tissue has been grown previously in the lab, the tissue that results, say the researchers, is often weak and not resembling real heart tissue in humans. In June 2013, Radisic’s lab published its findings on creating single strands of biocompatible fiber they call Biowire for growing synthetic heart tissue. The lab’s new research extends that idea to a two-dimensional biocompatible mesh that offers a scaffold for forming heart muscle in the lab. The researchers use a biocompatible and degradable polymer material known as POMaC for the mesh, that’s also soft, elastic, and responds to an electric current. The Toronto team designed the structure of the POMaC mesh to maximize speed and ease of assembly. The mesh has an asymmetrical honeycomb shape, with one end of the honeycomb cells wider than the other. This asymmetrical shape helps the cardiac cells assemble and grow together. The mesh adds tiny posts, shaped like a T, that make it possible to connect together layers of mesh in a three-dimensional framework. The T-shaped posts latch on to the adjacent honeycomb layer, like a burr or Velcro snag and attach to fabric, thus the name Tissue-Velcro given to their discovery. In lab tests, connected sheets of synthetic tissue formed with Tissue-Velcro were found to begin beating almost immediately after stimulated with an electric current. In addition, the researchers found they could easily disassemble the layers of tissue cells, making it easier to test reactions of the cells to various stimuli. The team notes that the technology can be applied to growing synthetic tissue in other organs, such as liver or lungs.